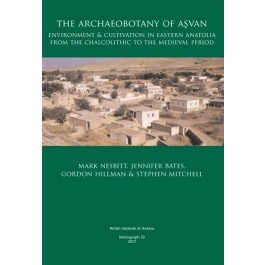 This volume contains the final publication of the archaeobotanical remains recovered from four sites at the village of Aşvan in eastern Turkey, which were excavated between 1968 and 1973 as part of the archaeological rescue project in the Keban Dam region. An extensive programme of archaeobotanical research involved detailed study of the modern flora, the observation and recording of pre-mechanised agricultural practices and large-scale recovery of ancient botanical samples by water sieving. The report traces the evolution of cultivation in the region from the Chalcolithic to the Medieval period, charting the dominance of emmer and hulled barley in the Chalcolithic period, the emergence of free-threshing wheats in the Early Bronze Age and the introduction of irrigated summer crops, especially millet, by the Hellenistic period. Detailed attention is also given to the assemblage of weed seeds as proxy evidence for environmental conditions and climate change from around 4000 BC to the present day. "Specialists have been impatiently waiting for the publication of “The Archaeobotany of Aşvan”. Their long wait has been rewarded...This publication is a must for the bookshelves of archaeobotanical laboratories and specialists alike."